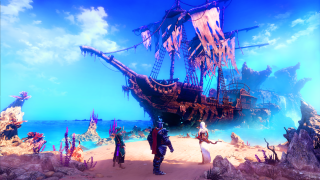 IGN has posted a Trine 3 gameplay video demonstrating how Pontius, Zoya, and Amadeus—that would be the warrior, the thief, and the wizard—will interact in the game's newly-3D world. The video runs about nine minutes in total, and shows all three characters in action, doing what they do best: Pontius smashing things, Zoya climbing on them, and Amadeus levitating them. The difference is that they're now doing it in three dimensions, which as you can imagine adds a certain element of complexity to the proceedings. And therein lies the one area of concern I have about the game. Trine is a platformer that relies heavily on physics-based puzzles, and maneuvering through the trickiest of them is tough enough in two dimensions. Having to deal with a third, while Amadeus is juggling cubes or Zoya is trying to land a particularly difficult swing, might lead to frustration if it's flubbed. On the other hand, I've often wished that I could 'go deeper' into Trine's gorgeous locales, to explore a bit, or at least get a closer look at all the window dressing that makes it so magical, and now I'll be able to. So, maybe this is a good thing? I hope it is. We'll know when Trine 3 is out later this year.